Use filters on carrier rules to affect shipping rates based on price, weight, or quantity thresholds. For example: over $100 in cart value, you want to set the price of Ground Shipping to free. The filter in this scenario a price filter. Each filter allows you to set whether filters are looking at the entire order, the part of the order being shipped from a specific origin, the part of the order belonging to a specific shipping group, or each item within a certain shipping group. A filter must be applied to a Carrier Rule in order to be effective. Select how the filter will apply: Whole Cart, Everything in Shipping Group, Everything in Origin, or Each Item within Shipping Group. See below for insight on each option. 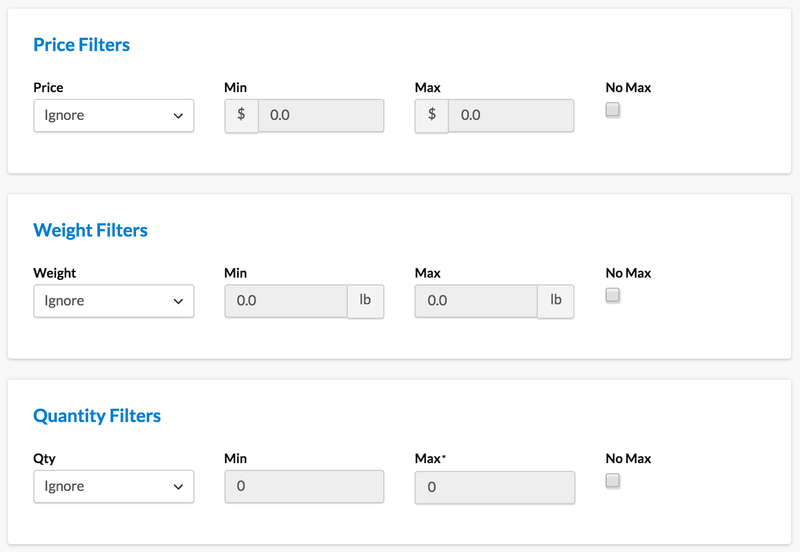 For Example: if you want to Filter by Price you will need to select “Range” under Price Filters and enter the min/max for the prices that apply for this filter. Weight and Quantity should both be set to Ignore in this case. Whole Cart: you want the filter to read the entire cart’s price, quantity, or weight. Everything in Shipping Group: you want the filter to read for a specific Shipping Group’s price, quantity, or weight. Everything at Origin: you want the filter to read the price, quantity, or weight of only the products shipping from a specific origin. Each Item within Shipping Group: you want the filter to read for price or weight of each individual item within a Shipping Group. NOTE: quantity is not typically used in this setting. When setting up your ranges, it’s important to remember that Min is an inclusive value (that is, if your Min entry is $5, for example, this will include anything equal to or greater than $5) and Max is an exclusive value (that is, if your Max entry is $10 it will include anything up to but not including $10). This means ranges can be set using whole numbers. For example, you can set up filters for 0-100 lbs and 100 to 200 lbs instead of 0-99.99 lbs and 100-199.99 lbs. ShipperHQ has the ability to allow you to create your own shipping rates based on the volume as well as the actual weight. You can choose to create rates based on both of those values at the same time, or use the higher of actual weight and volume weight. The values used in volume filtering are values entered in the Volume field on your products in your eCommerce platform. This is different from ShipperHQ’s Dimensional shipping functionality and requires that you define the specific volume of each product. Volume Filtering is currently only supported for Magento 1.x, Magento 2.x, and Zoey using the volume weight attribute (shipperhq_volume_weight). On the Carrier Rules page in ShipperHQ, click the “Settings” button at the top right. Under “Filter Based On”, enable “Volume Based Filtering”. Once this is enabled, you’ll see new Volume-related options under the Advanced tab on Filters and Carriers. This only applies to custom rate carriers. On the Advanced tab when editing a Custom Rate Carrier, you’ll see the “Filter based on higher of Actual Weight and Volume Weight” checkbox. Check this and save the carrier. Now the higher of the actual weight and volume weight will be used as the weight value in Carrier Rules for this Carrier. After a filter is created, you can add it to any Carrier Rule in ShipperHQ that needs it. For example: adding it to a Free Shipping over $50 rule.